Immortalised moments. The moment of satisfaction mixed with strange sadness after having made the final touch to complete a creation that one is content with at that particular time; or the rare moments seen, appreciated and captured by means of a camera, perhaps last week, or many years ago, examples which, in principle, should always speak for themselves. 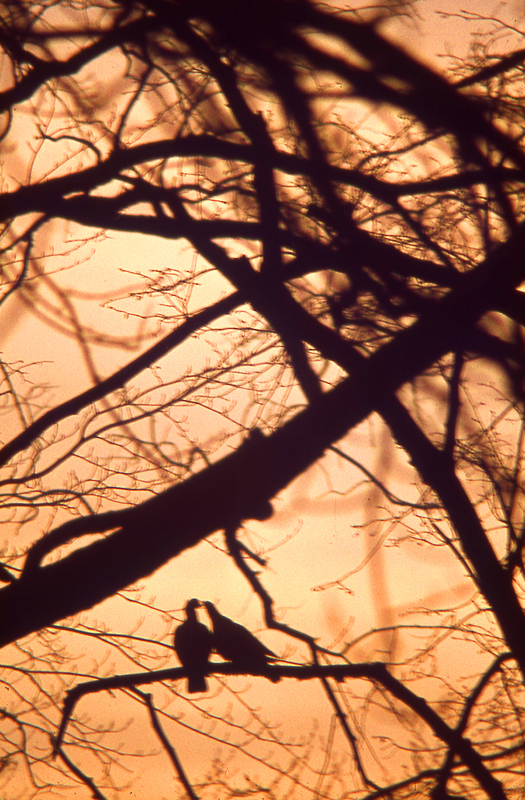 Scans of old transparencies. In those days it was thought that results obtained on fine-grain reversal film with a good reflex camera could never be improved upon. Who would have thought that in less than fourteen years or so, this would prove to be quite wrong? And digital results can only continue to improve, even to an excessive extent for most professional photographers. It's true that colour correction in printing becomes more difficult if the resolution of scans is above a certain level considered acceptable. Many years ago I bought the all mechanical, Mamiya RB67 with the rotating film back for 120 or 220 roll film. I used it mainly to reproduce illustrations, and experiment with double exposures. I managed to get good, printable results at required formats of originals, on 6cm x 7cm transparencies. Naturally this was before scanners were perfected. I bought the Mamiya new, and several years later, incredibly, I sold it to a camera shop for more than I originally paid for it. But that was how things still were, even then, back in the nineties. Since those days, the problems of combining images, painfully obtained by approximate calculation before taking double exposures with a camera, are now easily solved with complete control thanks to computer technology. Yet naturally it's not technology, resolution or definition that determines art. Nor is it time, as history constantly reminds us. 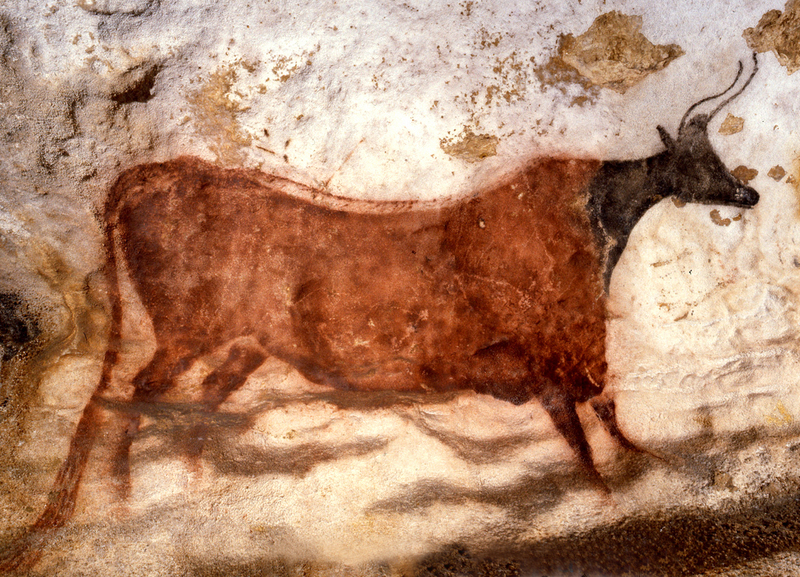 One only has to refer to the Palaeolithic paintings of the Lascaux caves of Dordogne in France to appreciate this. 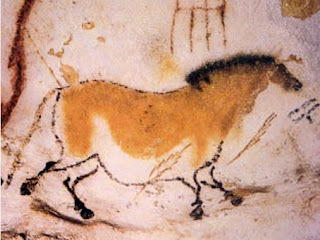 And these paintings are estimated to be more than 17, 300 years old! 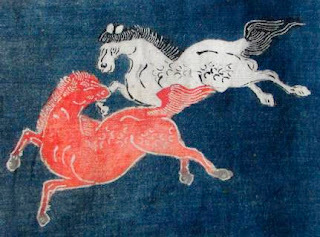 Like most great works of art, they are thought to contain secrets such as astronomical diagrams of that period, perhaps wrongly termed as 'prehistoric'. For if there's any truth in the theory I refer to as the Noah cycle, would there be any end or beginning to cosmic evolution or universal history? Presumably with regard to 'newly born' planets that glimmer, rotate and circumvent within their solar system for the duration of millions of years or light-years, before their resources run dry and they are eventually consumed like the candle of life. 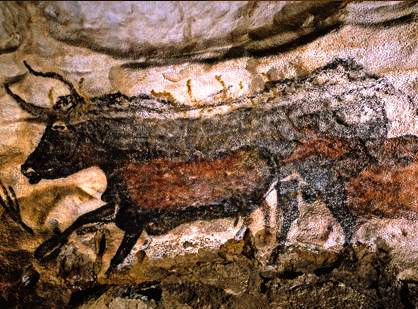 However, without considering any astronomical, scientific or even astrological and religious theories, most artists would agree, and always be convinced that despite their incredible age the Lascaux paintings are far from primitive. Indeed, some of the paintings and drawings of Lascaux could be very favourably likened to the best of old Japanese and Chinese free renderings of animals. They reflect the same knowledge gained from careful observation and respect. This is clearly apparent regarding the confident drawing of leg and hoof articulations, muscular forms, free and intelligent use of line and colour, and what seems to be an instinctive knowledge of perspective. Although the project is necessary and praiseworthy, it's hard to believe that trying to reproduce the Lascaux work, in order to protect the originals from the damage caused by light, etc., would be successful, for the simple reason that when one's priority is the technical process of reproducing such work, one invariably loses the essence of the creation, l'âme, the confident spontaneity determined by the artist's experience, knowledge, feelings and appreciation. The very reason of being of the work itself. 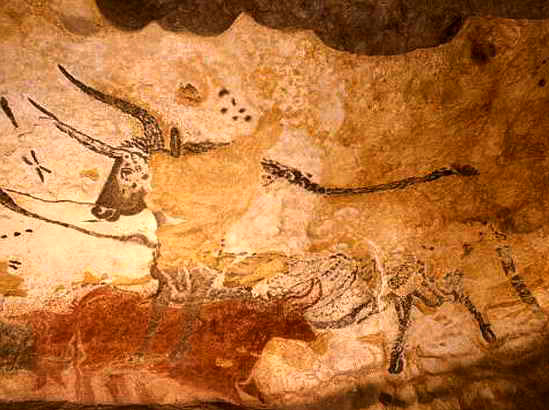 (Perhaps reproducing the rock formations of the Lascaux caves and photographing and projecting the images of the originals on the reproduced surfaces would be far more effective and integral). The Palaeolithic man's knowledge of the animals on which their lives must then have depended, the character, anatomy, colour and movements of the animals were studied and rendered with acute observation, freedom, confidence, sensitivity and respect, which is why we still admire them, and are indeed continually amazed by them, just as one might admire and be amazed by fine Renaissance paintings and drawings. The essence of art emanates from the Lascaux paintings as it does from all inspired masterpieces created in their time throughout the long and often troubled ages of humanity. One might easily jump to conclusions regarding the Palaeolithic (or Cro-Magnon) stick rendering of men, but an artist who can draw animals so well, would also be able to draw a man or a woman equally well, if this was what the artist wanted to do. But clearly this was neither the wish nor the intention. 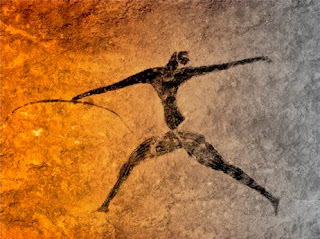 Men were thus drawn symbolically, perhaps because in relation to the animals on which life and perhaps even a form of faith then totally depended, man was apparently considered relatively insignificant. This obviously including the artists themselves, capable of immortalising the life of their period over seventeen thousand years ago, for the benefit of mankind and countless thousands of man's future generations. If this is so, would it not already demonstrate commendable humility in relation to their natural environment? So it goes without saying that art never depends on a wealth of the best materials and electronic equipment. 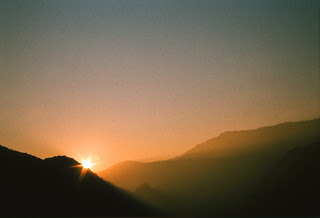 It simply depends on sentiment, emotion, observation, discernment, knowledge, sensitivity and poetry- together with the means, no matter how rudimentary, to express this combination, be it with a pointed stone and a flat rock on which to inscribe such an inspired and evocative image for posterity. I have twice alluded to the film To Fly, that one can still see at the Smithsonian Air and Space Museum in Washington DC, and the fact that it was made in the seventies. Naturally other films for the museum have since been made, no doubt with much better equipment, more sophisticated technology and certainly at a higher image resolution and thus finer definition. But even the staff employed at the Air and Space museum would agree that To Fly, is still the best film. Why? 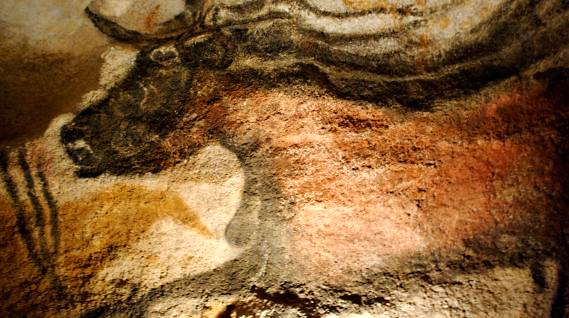 Simply because it's a work of art, like many of the fabulous 17, 300 year old paintings of Lascaux. The history of art is the mirror of humanity, the history of all civilisations. It is a recorded combination of every intellectual subject, observation, emotion, history and belief concerning humanity. If more people of various cultures and religions studied and appreciated the world's history of art, perhaps they would also understand that all religions stem from one unique root. Thus they would respect and admire antiquity, the evolution of humanity, and the different cultural and religious branches that grow from this magnificent tree of civilisation. They would finally understand that they are a small yet intrinsic thus essential part of this beautiful tree. A tree that strives by way of its various branches to reach the heavens. And this in turn would generate tolerance that also engenders love, the fruit of knowledge and understanding. An apple, a world, the whole universe. How do we contact you to discuss the possibility of using one of your images? Thanks so much.